The Board of Directors for Oliver Hazard Perry Rhode Island (OHPRI) has selected an alternative platform for its 2014 Education at Sea programs while construction of Rhode Island’s official Sailing Education Vessel, the 200-foot SSV Oliver Hazard Perry, is completed. The SV Mystic, a 180-foot USCG certified and inspected three-masted square topsail schooner, will carry out OHPRI’s schedule of teen summer camps and voyages for adults. 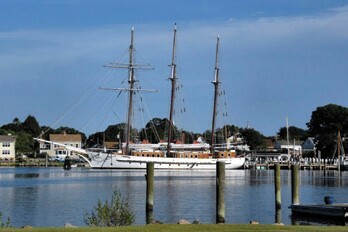 More than 250 trainees will be hosted aboard the Mystic for OHPRI programs this summer. Built in 2007, Mystic is steel-hulled, has 45 berths, and will have as its master the captain of Oliver Hazard Perry, Richard Bailey. The Perry’s six miles of rigging are currently being assembled in Portsmouth, RI by a team of 20 riggers. Its three masts, with the tallest more than 13 stories high, will carry 20 sails with 14,000 square feet of sail area. For more information on OHPRI’s 2014 summer sessions, visit ohpri.org or contact Jess Wurzbacher or Elise Huebner at 401-841-0080 or info@ohpri.org.